Nuts are extremely nutritious ingredients, rich in proteins, vitamins, fibre, and especially fats! The high fat content of nuts is due to the large amount of oil found in them. 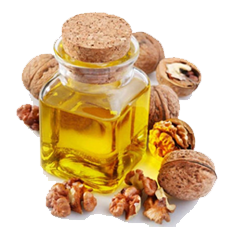 This blog explains about the different types of nut oil available and what they can be used for. Nuts do not store their energy in starch but in oil, which is why they each contain a large amount. The amount of oil also differs per type of nut. These fats, which are predominantly unsaturated, produce a pleasant buttery sensation in the mouth. Cold-pressed oils: the nut cells are crushed and release the oil under pressure. These cloudy oils have a strong flavour and are used in cold preparations such as dressings or vinaigrettes. Hot-pressed oils: the crushed nuts are treated with a solvent at a temperature of 150°C. The solvent ensures the oil is separated. These clear oils have a mild or neutral flavour and are used in preparation methods based on heat such as frying or deep-frying. Nut oils are susceptible to oxidation. They must therefore be stored in a dry, dark, and cool place (7-12°C). Home-made oils must be stored in air-tight, dark-coloured bottles. Never use oils that do not taste or smell of nuts as these will be rancid and can no longer be used.